There is a passenger ferry terminal at Main Street along the Estuary. 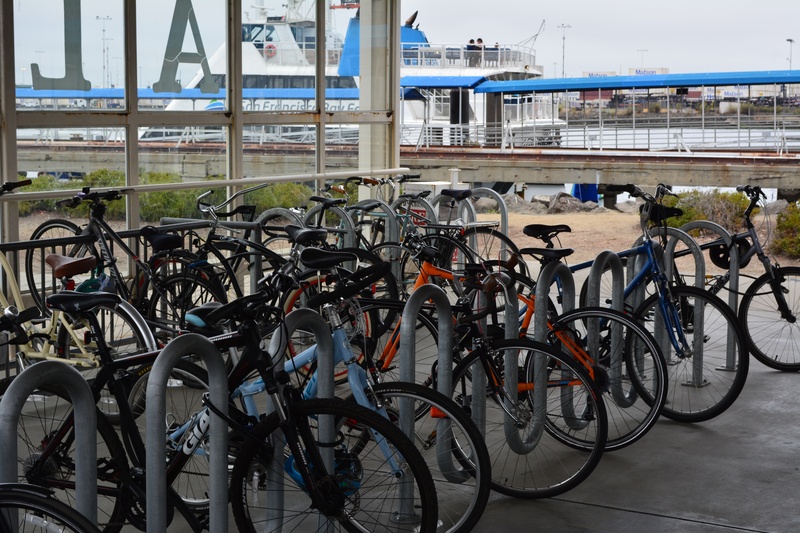 The Water Emergency Transportation Authority (WETA) for San Francisco Bay, a state agency, has been busy planning for increased service both in Alameda and around the Bay. WETA will be running more ferries down the Estuary when the Brooklyn Basin mixed-used project is completed in Oakland. 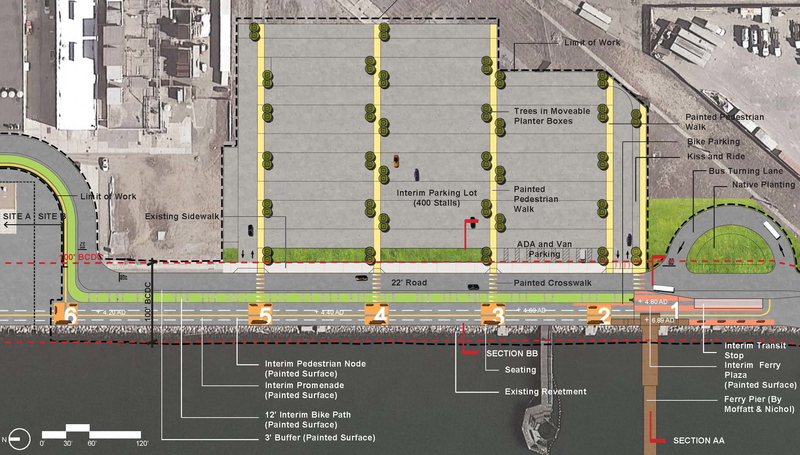 Plans are now underway for another terminal at the Seaplane Lagoon at Alameda Point. 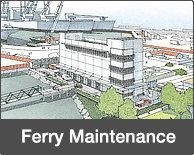 The 1996 community reuse plan for the Alameda Naval Air Station envisioned a passenger ferry terminal at the south side of Alameda Point where the ferry maintenance facility is now going to be located. In 2006, the preliminary development concept (PDC) for Alameda Point envisioned a ferry passenger terminal at the Seaplane Lagoon. 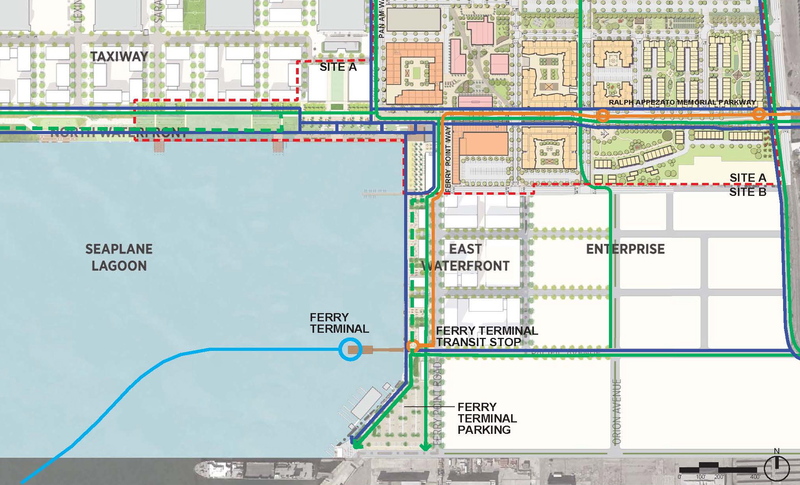 The PDC also assumed that the city-owned Main Street Ferry Terminal would be closed when the Seaplane Lagoon Terminal opened. 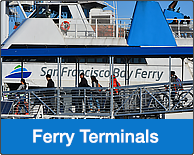 In 2008, a new ferry agency was formed called the Water Emergency Transportation Authority (WETA), which took over Alameda and Vallejo's ferry service. WETA became the owner of the Main Street Terminal. In 2010, master developer SunCal's plan for around 5,000 homes at Alameda Point was defeated by voters. In 2011, the city decided to have a city-run redevelopment process rather than turning it over to a single master developer. 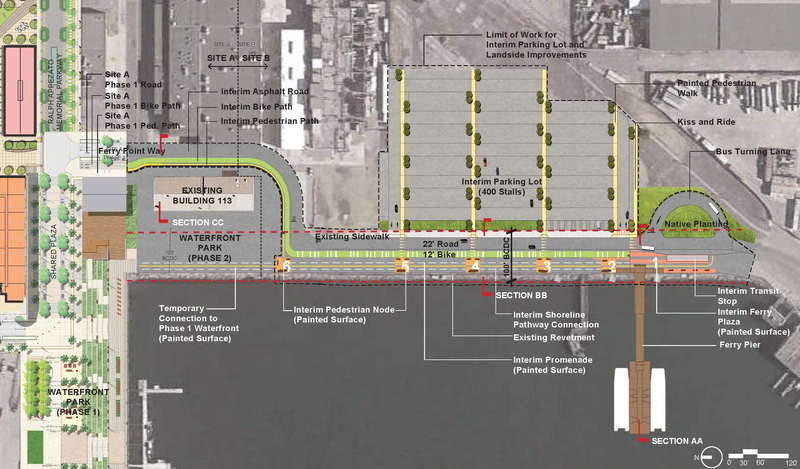 In 2012, the city applied for and received a grant from the Metropolitan Transportation Commission to fund a development plan for a portion of Alameda Point around the Seaplane Lagoon, called the Town Center and Waterfront Plan. 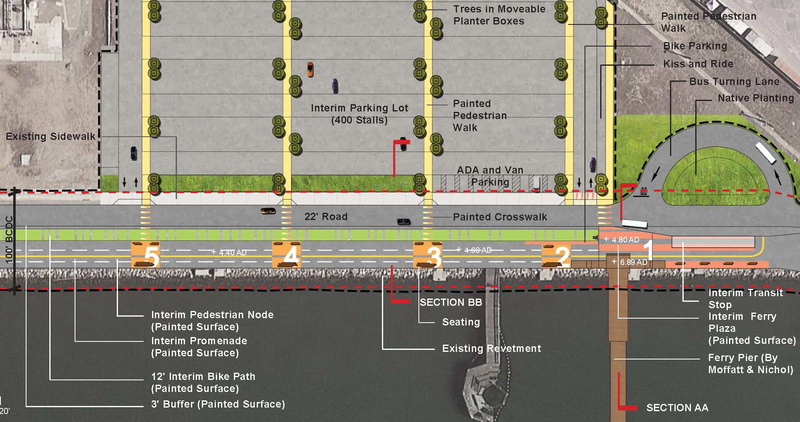 A key element in the plan was the inclusion of a transit hub, featuring buses and ferries. The city and the developer-community believed ferry service would attract business and new residents. In 2014, a $10 million contribution toward the construction of the Seaplane Lagoon Ferry Terminal was one of the requirements for being selected as the developer for Site A. 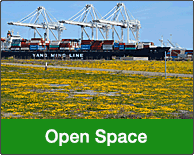 The city selected Alameda Point Partners to develop 68 acres adjacent to the Seaplane Lagoon, known as Site A. The developer sees the proposed Seaplane Lagoon Ferry Terminal as a key amenity and marketing tool for the success of its development. The city has the same philosophy -- a ferry terminal is a good selling point for bringing new business and residents willing to pay top dollar. Nobody knows for certain where the operating funds for the Seaplane Lagoon ferry will come from. WETA is not going to fund operations, unless it gets a windfall from a new tax measure or the state. While the Site A developer has committed $10 million toward the terminal, other funding, including for a new ferryboat, is up in the air. Grants are being applied for. There are discussions about a possible new Bay Area bridge toll that may help fund operations. Pros: (1) Immediate improvement of the east side of the Seaplane Lagoon with landscaping, removal of rotten wooden dock, temporary parking lot. (2) More people with disposable income to spend in the area, potential source of patrons for Alameda Point businesses and USS Hornet Museum, more activity/vibrancy in the area. 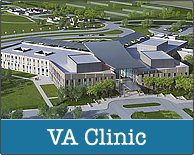 (3) May help attract businesses to the commercial zone right next to the terminal, which could, in turn, be a source of operating funds via fees. 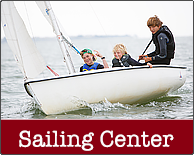 Cons: (1) Funding to operate and maintain the Seaplane Lagoon service could evaporate in the future during a period of cutbacks, making the effort a waste of good money that could have been spent on the Main Street Terminal parking lot expansion, or operating shuttles to the Main Street Terminal. (2) If the maritime ships are moved to another location in San Francisco Bay or the Delta (a real possibility) in the future, those three existing piers would be available for the ferry, which would make the new Seaplane Lagoon terminal appear to have been a rather unnecessary and hasty move. 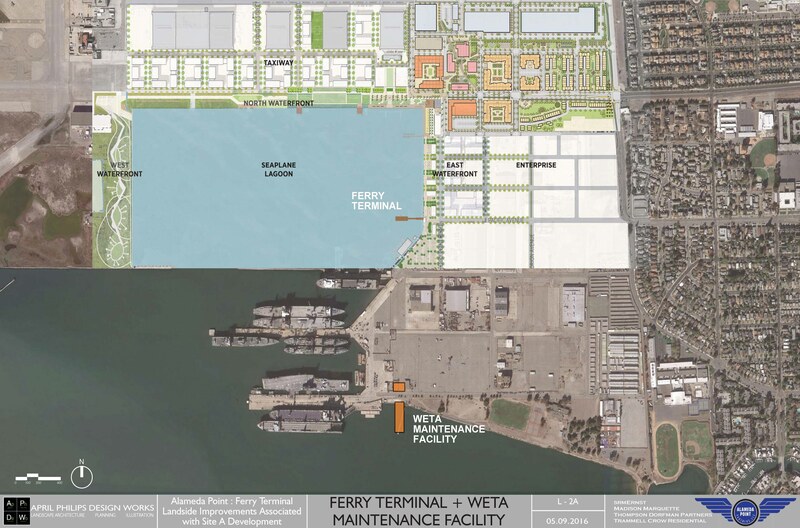 What to keep an eye on: Diverting Alameda Point lease revenue for WETA ferry operations in order to bring the service online. 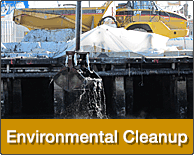 Lease revenue cash flow will be needed for routine maintenance for many years to come. But someone may propose to divert some of the lease revenue money to WETA, a state agency. A second ferry terminal on the West End is not necessary in order to provide more service and frequency. This can be achieved at one terminal.